Natan Sharansky, the former Soviet political prisoner and Jewish Agency chairman, put forth a "3D test" to distinguish between criticism of Israel and anti-Semitism. Criticism crosses into anti-Semitism when it delegitimizes or demonizes Israel, or subjects it to double standards. Thus, when Israel is cast as evil, when only Israel is held accountable in a conflict, and when Israel's fundamental right to exist as a Jewish homeland is questioned, criticism crosses into anti-Semitic territory. Through her actions and statements about Israel and Jews, celebrity Islamist activist Linda Sarsour fails the "3D test." In a recent Newsweek article, Sarsour argues that she has been labeled an anti-Semite because of her participation in the Boycott, Divestment, and Sanctions Movement. "This is a deliberate attempt to smear me, as a prominent leader in the progressive movement," she told the magazine. "They're basically criminalizing and defaming my work calling for human rights in Palestine. They equate activism on Palestine with anti-Semitism and that is an unfortunate equation." "The reason why Israel gets singled out in this debate is because the majority of military aid ... goes to Israel ... which they use to occupy Palestinians," Sarsour said in a radio interview last month on SiriusXM radio. Sarsour's answer is a self-serving attempt to divert attention away from her own words. It ignores her support of sharia law, her failure to denounce terrorism committed in the name of Islam, and her support of the violent Palestinian "resistance," all of which aligns her with anti-Semitism. Sarsour also tries to shut down those who cite her record of celebrating terrorists and advocating radical positions by calling the critics Islamophobes. "Linda Sarsour is a Palestinian Muslim American woman in a hijab and she has the audacity to be prominent in this country, the audacity to resonate with communities outside her community," she said, speaking in the third person in the SiriusXM interview. "How dare I do that? How dare I defy every stereotype that Islamophobes have of me." Yet, she's nakedly intolerant of beliefs other than her own. 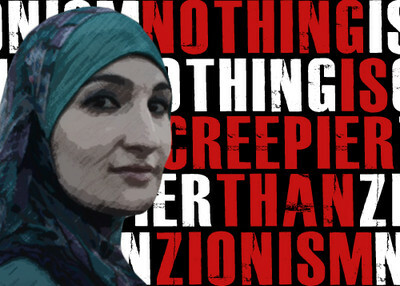 Sarsour famously tweeted, "Nothing is creepier than Zionism." That's not a statement critical of the Israeli government or of settlement building in the West Bank. Instead, Sarsour believes the entire concept of a homeland for the Jewish people is flawed, is "creepy." And Sarsour wants nothing to do with you if you believe in and support the state of Israel. That goes for Jews who might try to stand in solidarity against anti-Muslim bigotry. In her worldview, Zionism and feminism are mutually exclusive. "You either stand up for the rights of all women, including Palestinians, or none," Sarsour told The Nation. "There's just no way around it." "But insisting that Jews need not apply if they subscribe to the belief in a Jewish homeland in Israel is an anti-Semitic double standard," StandWithUs researcher Lauren Post wrote in the Forward. "Too many leftists already ignore anti-Semitism unless it's rhetorically convenient, so perhaps it's unsurprising that Sarsour's brand of feminism demands that we give up our liberation movement for some nebulous greater good." Women who disagree with Sarsour about feminism are met with sometimes profane attacks. She attacked ex-Muslim Ayaan Hirsi Ali, saying she deserves an "a$$ whippin'," and that she'd like to "take [Hirsi Ali and Islam critic Brigitte Gabriel's] vaginas away- they don't deserve to be women." New York State Assemblyman Dov Hikind, D-Brooklyn, called Sarsour out on her hypocrisy and double-standards after she was invited to give a commencement speech at CUNY School of Public Health in Brooklyn. Hikind highlighted Sarsour's dishonesty in a recent op-ed published in the New York Daily News. "Until recently, she'd convinced a lot of people that she stood for progressive liberalism, stood for feminism, stood for dignity, human rights and all of the things that people who favor the liberal left say they stand for, too," Hikind wrote. "But there's an old saying: You can't hide the crazy." That "crazy" includes embracing Rasmieh Odeh, a convicted terrorist whose participation in a 1969 grocery store bombing in Jerusalem killed two college students. Sarsour called it an honor to be in Odeh's presence after Odeh announced her intention to plead guilty to naturalization fraud. Sarsour "associates with terrorism and supports terrorism," Hikind told the Investigative Project on Terrorism. "Her record, her involvement, her statements, is just beyond the pale. What kind of message does that send?" It is not clear if Sarsour is feeling the heat or has other motivations, but she is orchestrating a broad campaign to insulate herself from questions of whether she fails the 3D test and crosses into anti-Semitism. 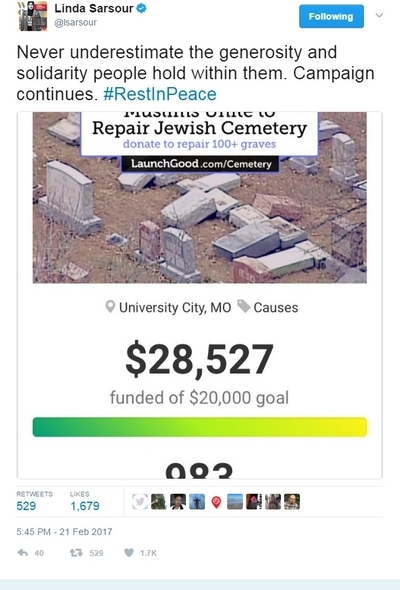 When vandals desecrated a Jewish cemetery in St. Louis, Sarsour made sure everyone saw her helping raise money to repair the damage even though those cemeteries likely included (shudder) Zionists. Still, her efforts garnered unquestioning national attention. "This is another way for us to publicly defy the stereotype that Muslims and Jews are not communities that can get along," she told National Public Radio. Sarsour also appears in a video produced by the anti-Israel group Jewish Voice for Peace, in which she said a "conversation on anti-Semitism is so critical at this moment." But that good deed can't be done without qualification, as she says accusations of anti-Semitism are often "used by the right wing against Palestinians and those who are pro-Palestine ... [to say] that we are anti-Semitic, or because we're critics of the State of Israel that means we are anti-Semitic." Anti-Semitism is a problem, she says in the video. It's just not as bad as racism or anti-Muslim bigotry. Most Jews are white, after all, and therefore do not face systemic discrimination in employment or housing. "And we need to make that distinction." Again, Sarsour offers a self-serving answer meant to define a problem on terms best suited for her. It's a gross misrepresentation that minimizes the threat of anti-Semitism in America. The latest FBI hate crime data, covering the year 2015, shows Jews are targeted more than twice as often as Muslims in hate crimes motivated by religious identity. In fact, Jews account for more than half of all hate crimes based on religion, with 664 documented incidents in 2015, compared to 257 targeting Muslims. Generally speaking, activism is something worth celebrating. But Sarsour is notorious for her controversy and her double-standards. And praising Sarsour as a "champion of change" does harm to the legitimate struggle for human rights, and for the fight against anti-Semitism. We need not embrace someone who defends and supports extremism in the name of social justice.